The departement of the Alpes Maritimes - Pop. : 464 inh. 70 km north east of Nice by the D2204 via Sospel or 50 km north of Menton on the D2566 to Sospel. In olden times, the stronghold of Saorge was defended by three castles. It was reputed to be impregnable, and was known as "the lock of la Roya". 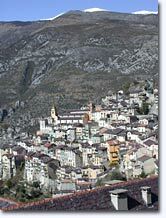 It is easy to understand why when you look at this medieval village from a distance. It spreads out like an amphitheatre overlooking the breathtaking La Roya gorge. The village built right on the rock gives a strong impression of cosiness and safety when you enter it. Take the very long cobbled street that climbs gently up to the Monastery, and let yourself be enchanted by the charm of the tall houses (often more than 5 floors) from bygone centuries (15th to 17th century). Walk around the maze of narrow stepped streets and picturesque architectural details are sure to catch your eye : lintels, vaulted porches, sundials, murals and friezess. 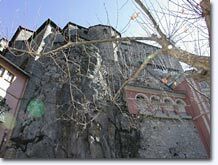 Overlooking the village is the baroque style Franciscan Monastery with its trompe-l'oeil facade. 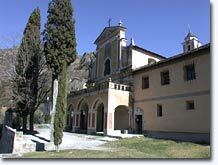 Inside it has superb woodwork, while the cloister of the convent is decorated with frescoes representing the life of St. Francis of Assisi. It also contains some beautiful sundials. From this height, you will be captivated by the harmonious appearance of the village, with the blue-mauve of the slated roofs, the off-white of the facades, magnificently faded by the sun, and the touches of bright colours from the varnished tiles on some of the bell towers. 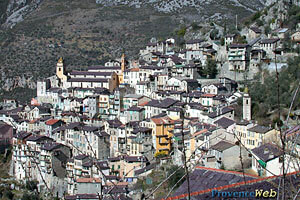 Take the time to walk down to the Madona del Poggio, located below the village (but be careful, its a steep slope!). There you can admire its superb Romanesque, Lombardy style bell tower, but only from the exterior, it is not open to the public. It has been maintained and restored with taste. The light plays across its old stones. Saorge is a village full of surprises. If you like strong emotions you won't forget the "Bendola", the biggest canyon in the Alpes Maritimes. It has been transformed into a water sports course (jumps and abseiling in a torrent and limpid pools). 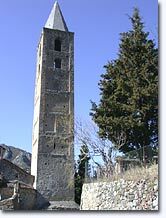 Madona del Poggio (11th century, 15th century Romanesque bell tower). Parish Church St Sauveur, XVIth. Organ belonging to the Lingiardi brothers. Crafts (olive wood, dried flowers). Fontan (3km), Breil sur Roya (7km), Tende (12km), La Brigue (12km).